As 2013 dawns upon us, the battle in the smartphone marketplace between Google’s Android operating system and Apple’s iOS shows no sign of letting up. Yet it is more than the battle between two software giants to control the way that we use our phones, but a mere skirmish in the longer war between open-sourced and closed-development software and the arguments that rage within about standards of quality versus openness and transparency. The release of the original iPhone was a major breakthrough in phone technology; before whilstsome phones had clunky application-style widgets and user interfaces no manufacturer had made the leap to the next level of phone technology. Like its computers in the eighties, Apple revolutionised the look and feel of mobile phones with a new style of graphical user interface (GUI) that changed the way we thought about how phones operated. Instead of a phone with a camera or a walkman “bolted on” as an extension the iPhone combined all aspects of hardware to bring into being a paradigm shift in phone technology – the smartphone. It marked a sea change in the way we use mobile handsets and the way we accessed the internet on the move, and it took a long time for other companies to catch up. However, in the six years since the launch of the iPhone in 2007 things have changed with the entrance of Google to the world of mobile operating systems. Google’s dominance online gave it the muscle to be able to develop a whole new operating system that would be as eagerly anticipated as the iPhone revolution. Rather than build upon an existing hardware brand like iPhone did on iPods, Google built the Android brand on their online software, allowing a user to sync their phone to their online world with seamless ease. Like Apple, Google’s brand loyalty allowed it to take a large share of the mobile phone market straight away, unlike other operating systems that tried to compete with iOS like Symbian and Windows Mobile. At the moment, Google lead in market share in both this country and on a global perspective. There are (according to this report from zdnet which references a Comscore report from December 13) 30.9million smartphones in use in the United Kingdom – one for every two people in the country – and of those nearly half – 14.4million or 46.6% of the total – use the Android operating system. In other words, one in every four people in the UK own an Android phone on average, which shows incredibly market penetration. This compares favourably with Apple, who’s iOS is used in 8.9million or 28% of UK smartphones. On a global perspective those figures are even higher, with the IDC report for the third quarter of 2012 issued in November showing that some three quarters of phones globally use Android in comparison to iOS which comes in with just 14.9% – less than a fifth of the number of their open-sourced competitor. A survey conducted by IDC showed that 88.9% of mobile developers expected that they will be developing apps for two or more mobile operating systems in the next year which shows that whilst Android have clearly got the lead share that iOS is still seen as a huge market that cannot be underestimated. In the coming times IDC expects Android’s market share to dip slightly towards the 60% mark over the next four years whilst they expect the iOS share to remain fairly solid in the face of competition from the mobile windows platform. One would expect that the brand loyalty that Apple have managed to generate for their iPhone series will ensure that iOS remains a competitive mobile platform whilst Microsoft try to barge their way back into the market with their next evolution of Windows phones. However, whilst these figures show that Android has a greater market penetration, it’s germane to note that Apple’s figures are made up purely of the products they sell as opposed to Android which is used in a far greater number of handsets. When one considers that there are nine major manufacturers of Android phone each with their own range as opposed to just six models of iPhone (of which the earlier models will be mostly not in use any more due to obsolescence) then it shows just how well the iPhone series has penetrated the smartphone market and how important the iOS system is. 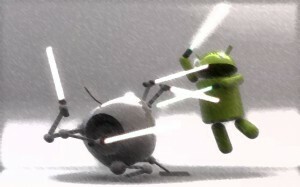 One cannot underestimate how hard Google has worked to make Android the dominant mobile OS in the marketplace however. Whilst having an open-sourced operating system has allowed developers to easily make apps for Android devices in comparison to iOS, the fragmentation of control Google had over the manufacturers of handsets mean that early versions of Android just weren’t up to the quality of iOS. Google changed this with the release of Android 4.0 – known as “Ice Cream Sandwich” or “ICS”. One of the most important benchmarks to evaluate mobile phones is the number of steps a user is required to make to complete an operation. Prior to the release of ICS, Android was inefficient, with some tasks being made overly complicated due to the user not being able to keep track of what apps were running. ICS introduced a “ribbon”, with it’s own dedicated button that allows a user to go to and from an app where it was being used, and an important “context” memory that allowed a user to return to a previous position within a differing app when the back button was pressed. With the user able to close an app by “flicking” it off the screen, it enabled a user to be able to control an app with fewer strokes and thus improve the efficiency of use. However, only the newer generations of smartphones such as the Galaxy SIII are able to use ICS and it’s update Android 4.1 and 4.2 “Jellybean”. Many users are still using smartphones which are older and either cannot handle or have not been the offered the upgrade and are still using older systems such as Android 2.3 “Gingerbread”. Therefore from a developer point of view it’s imperative when creating an app for an Android based system that it has backwards compatibility. Apple has a much different system with it’s iOS. Due to the fact that Apple not only make the operating system but the hardware as well they have a much tighter integration between operating system and phone and thus as their operating system has evolved it has managed to have the efficiency that Android lacked from an early stage. Apple actively encourages all users to update their phone software when a new iteration of iOS comes out, ensuring that there is a fairly standard operating system for developers to create apps for. This is shown when usability tests are done comparing Android and iOS handsets. Whilst Android came out favourably in this comparison it was noted that the quality of the handset made a massive difference. A good Android handset could outperform a iOS smartphone but a cheaper, poorer version of an Android smartphone isn’t going to come near to competing with it’s Apple rival. One of the chief criticisms of the open-sourced base of Android is that rather than improving quality it will force applications down to a lowest common denominator level to ensure that they will work on the majority of handsets. The release of updates such as Jellybean isn’t without criticism either. Whilst updating operating systems is undoubtedly done with the intention of making handsets work better and removing bugs there is criticism that the rapid development cycle of Android is leaving developers behind. Manufacturers of phones like HTC and Samsung have struggled in the past to develop the custom “skins” for their phones at the pace of the updates and this has left users suffering bugs in the firmware that they needn’t have to. However, Google have responded to that criticism and following Jellybean they are slowing the release cycle of Android to around once a year to allow manufacturers to catch up. In comparison, rumours abound that Apple are speeding up their development cycle for the iPad for instance to once every six months as they look to widen the gap between their technology and that of their competitors and one must wonder if they will create the same problems for app developers as the ones Android faced. From a stability point of view the release of Jellybean has seen Android finally catch up to a level where it’s equal or better to the latest incarnation of iOS, 6.0. One of the keys to this was Google’s “Project Butter”, which using touch anticipation, triple buffering and a fixed screen frame rate of 60 fps made the user interface “buttery-smooth” (to use Google’s own words), which brought the Android UI to look and feel as quick and intuitive as the iOS version. As an example, with the Jellybean system a user can read a whole text in the notification bar rather than having to open the messaging app to review a new SMS. It’s a simple thing but improves speed and usability, and coupled with other improvements makes the phone more stable and less likely for an app to crash. With the release of 4G in September 2012 in the United Kingdom the way we use mobile phones is set to change again. With ultra-broadband connections now available at rates on average of 6Mbits/second (as opposed to 1MBit/second) it is expected that mobile phones will take greater usage of video streaming and real-time mapping software as the bandwidth will be available to make both usable without buffering. However, this isn’t without issue either as the iPhone 5 is only compatible with 4G in Germany and the UK whilst as a comparison the Samsung Galaxy S3 has a version made specifically for European markets and will be able to offer a 4G connection across Europe. The iPhone 5 is made predominantly for the US market which uses a different frequency of 4G which isn’t compatible with the standards being offered on the continent. who have suffered the major mishaps with the controversy over the poor quality of Apple Maps when Apple switched from using Google’s mapping data to their own in 2012 being a prime example. The challenge that faces Apple now is ensuring that they maintain their lead in the evolution of mobile phones and tablets by continuing to create innovative applications that other developers haven’t been able to envisage or create. Google’s successes have come from allowing manufacturers to put their own stamp on their Android phones with their customisable skins and with the problems with the speed in development cycles now being sorted Apple face a real battle to remain the number one desirable brand. If you would like to discuss which devices would work best with Field Service Management Software call JobLogic on 0121 250 1027. This entry was posted in Articles, iPhone and tagged Android, iPhone. Bookmark the permalink.